Andreas Wilhelm Schwarzlose was born on 31 July 1867 in Wust, Prussia and died on 18 April 1936 in Charlottenburg, Germany. Early on he had artistic inclinations, but after being conscripted into the German army he developed an interest in small arms. He received his first patent for a self-loading pistol late in 1892, of which a single prototype was known to exist (it was stolen from the Musée D’Armes at Liege in 1970). He received his second patent for a self-loading pistol in 1894, his third in 1895, and his fourth in 1897. In 1901 he was granted two patents for a self-loading pistol which became known as the Standart model or the Model 1901--possibly only a few hundred examples of this gun were ever produced. Also in 1901 he patented a toggle action mechanism for a handgun. Finally in 1907 he was granted three patents for his blow-forward design which became known as the Model 1909 Schwarzlose pistol. Some authors, such as Ian Hogg, Matthews, and W.H.B. Smith refer to the gun as the M1908, after the patent date, but European usage has generally been M1909, after the first year of production, and this was the usage employed by the Schwarzlose company itself in period advertising. During all the time that Schwarzlose was designing pistols, he was also working on various designs for machine guns. None of his pistol designs can be called a commercial success, whereas he ultimately became well known for his machine guns. Perhaps with a certain prescience, he adopted a machine gun logo for his company. 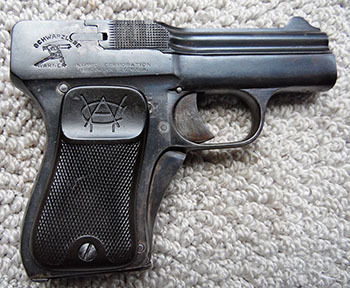 Manufacture of the 1909 Schwarzlose pocket pistol may have begun as early as 1908, after the first two patents were granted, although the third patent (for the grip safety) wasn’t granted until April 1909. Matthews states that production ended in 1911, and this is echoed by Gordon, whereas W.H.B. Smith states that production ended in 1915. However, it is nearly certain that production ended early in 1910, as the German weapons industry newsletter Der Waffenschmied noted in its 10 March 1910 issue that the employees of the Schwarzlose factory were locked out for refusing to work longer hours without a pay increase. Prior to this time, advertisements for the 1909 Schwarzlose pistol in Der Waffenschmied show the gun being sold by A.W. Schwarzlose G.m.b.H. of Berlin, with the German distributor being listed as G.C. Dornheim G.m.b.H. of Berlin; whereas after March of 1910 the advertisements show the gun being sold by Moritz Magnus jun. of Hamburg (a wholesaler of weapons and munitions), with the German distributor still listed as G.C. Dornheim G.m.b.H. A.W. Schwarzlose Gesellschaft für Waffenerzeugnisse m.b.H. declared bankruptcy on 20 May 1910 (this was reported in Der Waffenschmied for 10 June 1910). In the 25 October 1910 issue of Der Waffenschmied there is an advertisement stating that G.C. Dornheim G.m.b.H. has taken over the stock of completed Schwarzlose pistols from the bankrupt Schwarzlose factory and is offering the weapons at extraordinarily cheap prices. Friedrich Müller has created a database of known Schwarzlose M1909 pistols and notes in his article that nearly half the proofing of the gun must have taken place during or after 1912, since the vast majority of M1909 Schwarzlose pistols after serial number 3541 have the crown-N proof, which came into use in 1912. We believe that there must have been several thousand completed pistols that had not been proofed when the company went bankrupt, and these guns must have been proofed during or after 1912. Late in 1911 we find, in various U.S. magazines, advertisements for the Schwarzlose pistol being retailed by the Kirtland Brothers and Company of New York City, a sporting-goods dealer--these appear to be standard Model 1909 pistols just like the ones sold in Germany. In 1913 we begin to find similar advertisements, featuring the same gun but it is referred to as the “Warner Schwarzlose” and is being sold by the Warner Arms Corporation. In the Directory of Directors for New York City, 1915-1916, Franklin B. Warner is listed as president and director of the Kirtland Brothers & Company as well as of the Warner Arms Corporation, and Marvin J. Warner is listed as vice-president and director of both companies, so the gun was still being sold by the same people but under the auspices of a different company name. The gun pictured appears to still be the original Schwarzlose Model 1909 (which we refer to below as the first variant). Finally, in 1914 we begin to see additional advertisements for the Warner Schwarzlose, but the gun pictured is clearly a modified Model 1909, with checkering instead of serrations on the barrel/slide, a magazine release behind the trigger, and WAC monogram grips. This is what we refer to below as the Warner Schwarzlose Type 1, or the third variant Schwarzlose. Clearly, Franklin and Marvin Warner must have purchased a number of completed pistols as well as all the remaining parts. German patent number 196553 was applied for on 12 May 1907 and was granted on 27 March 1908. This patent covers the mechanism of disassembly by locking the recoil spring guide rod into a detente in the frame. It corresponds with Britsh patent number 10222 of 1908. German patent number 208540 was applied for on 23 June 1907 and was granted on 1 April 1909, and covers the grip safety which is linked to the tension of the mainspring, and a sear designed to also serve as an ejector. This patent corresponds with British patent number 20006 of 1907, and with some minor changes to U.S. patent 932183 of 1909. The most notable feature of the 1909 Schwarzlose is its “blow- forward” or “reverse-recoil” action, which allows the barrel to be the same length as that of any “blow-back” pistol, while the overall length of the gun may be shorter than usual, since the magazine is positioned beneath the barrel rather than behind it. Another feature, not quite so obvious is the flat mainspring that tensions the hammer, the magazine release, and the safety lever. 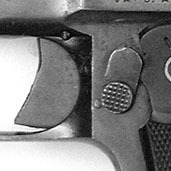 When the grip safety on front of the grip is squeezed it pulls a u- shaped connector bar at the base of the grip forward, putting enough tension on the bottom of the mainspring to allow the gun to be fired. The magazine release serves as a fulcrum point for the spring. If the grip safety is not squeezed there is insufficient tension in the mainspring to enable the hammer to ignite the primer. In its forward position, the grip safety blocks the trigger. A button on the left side of the gun may be pressed upward and allowed to come down when the safety is squeezed to lock the safety back, which makes it easier to aim the gun carefully for target shooting. The gun consists of two main pieces, the frame and the barrel/slide. The Schwarzlose company referred to the latter as the “barrel” but the reader should understand that the barrel is integral with what we today would call a slide, with longitudinal rails attached beneath the barrel which fit into slots inside the frame, and with an extension on the left side which contains the sear. 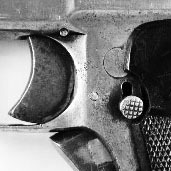 The sear lies flush with the lower face of the slide extension on the left side of the gun, and runs from just above the trigger to the rear of the gun. The rear portion of the sear is rounded and fits into a concavity in the left side of the hammer. The sear pivots on a pin and is able to move both up and down and from side to side. A protrusion on the bottom of the sear serves as a disconnector and fits into a concavity in the top of the frame when the slide is in battery. When the slide is out of battery the disconnector lifts the front end of the sear upward so it cannot contact the trigger bar. The trigger bar is vertical and sits just behind the trigger. When the slide is in battery and the sear connects with the trigger bar, if the trigger is pulled it causes the front of the sear to pivot inward and its rear to pivot outward, releasing the internal hammer. The hammer has a cone-shaped firing pin similar to European revolvers of the era. The firing pin strikes the cartridge through a hole in the breech block. The recoil spring, which lies beneath the barrel, is quite strong because the barrel/slide is relatively light. Similarly, the magazine spring is much more powerful than that of a normal automatic pistol--so much so that it can be difficult to load the seventh cartridge. The breech block is fixed in the rear of the frame just in front of the hammer. The spring-loaded internal extractor is fixed in the frame on the right side of the gun. The recoil spring guide rod is the means of disassembly--when it is pulled all the way forward it can be tilted slightly upward, which causes the front of the guide rod to catch in a detente in the frame above the trigger guard--the barrel/slide can then be slid forward off the frame. The cycle of operation is as follows: The gun is grasped in the shooting hand with the finger outside the triggerguard and the barrel/slide is drawn forward with the opposite hand. 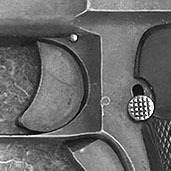 An extension on the left rear of the slide pulls the top cartridge forward in the magazine and the nose of the cartridge inclines upward. The barrel/slide is released and returns under tension of the recoil spring. As the barrel/slide moves to the rear, the ramp beneath and behind the barrel engages the cartridge, releases it from the magazine, and forces it into the chamber. The powerful magazine spring helps prevent the cartridge from being pushed back into the magazine. As the sear moves to the rear it engages the hammer and pushes it into the cocked position. When the trigger is pulled the trigger bar moves the sear laterally, releasing the hammer. The cartridge is ignited and the bullet pulls the barrel/slide forward with it. The barrel/slide motion is stopped when it has moved forward the length of the cartridge. The extractor holds the cartridge case against the fixed breech block, and when the slide extension comes forward it ejects the spent cartridge while simultaneously pulling the next cartridge into loading position. The compressed recoil spring beneath the barrel forces the barrel/slide back to the rear, chambering the next cartridge and pushing the hammer back into the cocked position. behind the trigger just above the right side of the grip plate. On the specimen we examined virtually every small part, down even to the hammer pin, were stamped with the full four-digit serial number. There are a few known specimens with no external serial number, and a few with no external markings of any kind. Grip plates are of hard rubber, with the grip screw at the bottom center, and the vast majority of them are checkered on about the lower two-thirds, with the upper third smooth, forming a slightly hollowed out area where the thumb can rest. A few grip plates are fully checkered, but these are quite scarce. Most early examples have crown over B and crown over U proof marks on the frame and barrel/slide, and most late examples have the crown over N proof, which came into use for pistols in 1912. Early barrel/slides are stamped on the inside of the left extension with the number 181, which is a gauge measurement of the diameter of the barrel. Guns with the later crown over N proof may not have this stamp. The magazine is of the standard type, with a rather long floor plate, and has six holes drilled in each side for viewing cartridges. It has very short feed lips and a deep cut in the front, allowing the cartridge to be pulled forward and tilted up when the barrel/slide is far enough forward. The magazine spring is quite strong, as it must be to prevent the cartridge from being pushed backward into the magazine by the recoiling barrel/slide. The last two Schwarzlose variants were sold in the United States under the auspices of the Warner Arms Corporation. Arms Corporation, which did not merge with N.R. Davis & Sons to form Davis-Warner Arms until later--in 1916. Third Variant - Warner Type 1. The third variant is blued and features checkering over the chamber area of the barrel. On this variant the grip safety and lock button are retained. 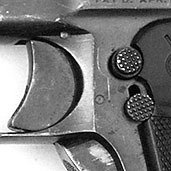 The grip safety has an oval area of checkering near the top, and the lower portion of the trigger has a similar oval area of checkering. The magazine release is a button just behind the trigger (in the same location as the manual safety on the fourth variant). This variant has a short external extractor on the right side of the frame that partially obscures the Schwarzlose name over the machine gun logo. The extractor is retained by a screw installed from the top of the breech block. Fourth Variant - Warner Type 2. The fourth variant is also blued and has shallow checkering over the chamber area of the barrel. 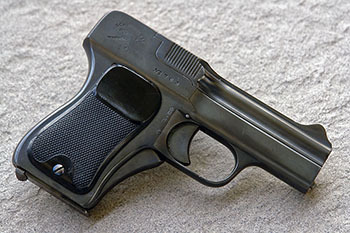 The grip safety has been eliminated along with the locking button, and the gun has a manual safety lever just behind the trigger where it can be easily reached by the thumb. On the right side is a long external extractor that partially obscures the Schwarzlose name over the machine gun logo. The magazine release is on the bottom of the grip, but it is flatter in profile than the release on guns made for German distribution. The upper (thumb rest) portion of the grip plates are marked with a WAC monogram. Markings are identical to the third variant. 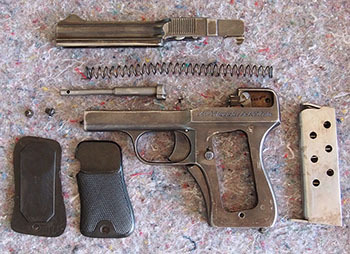 Also, according to James B. Stewart: “Before termination of production Schwarzlose had been experimenting with cost- reducing modifications, one of which was the removal of the grip safety, mainspring tensioning system, and grip safety lockout button and their replacement with a fixed mainspring and a simple trigger locking thumb safety. 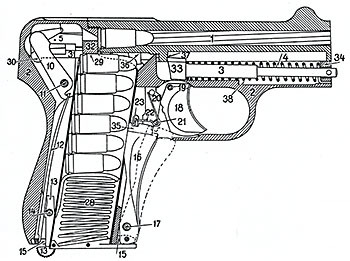 Pistol number 5710 shows a plugged hole in the frame at the location of this proposed manual safety although in all other respects it is identical to a normal production pistol.” He is describing the only documented deluxe model Schwarzlose. We believe Stewart was merely speculating when he speaks of “experimenting with cost-reducing modifications,” as we have found no documentation to back this up; however, based on what we know at this time his speculation is quite possibly correct. There is an existing Schwarzlose specimen with most of the characteristics of the Fourth Variant Warner Type 2, but with a rough, unfinished look and no external markings or proofs. This gun has no serrations, but rather “steps” on the rear of the barrel/slide. The only serial number is an internal 3. 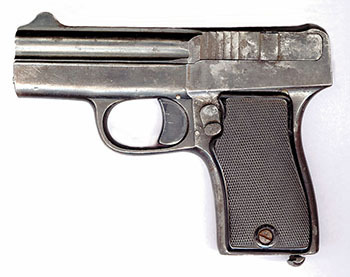 This gun is currently in a Czech collection, and has therefore probably never been in the United States, and may serve as a proof of the experimentation Stewart refers to above. Pawlas (in his Waffen Revue article “Die Schwarzlose-Pistolen”) designates this gun as a separate variant, but we believe it is essentially a prototype for what later became the Warner Type 2. This gun is also discussed in an article by Dr. Blatter in the Deutsches Waffenjournal for January 1968. Dr. Blatter states: “An old gun smith who had previously worked as an armorer for the military prior to WWI told me that in the 1920s there were Schwarzlose pistols on the market which did not have an inscription. The pistol shown above could be such a model or a test sample which belonged to the Schwarzlose Company.” A second gun with nearly identical characteristics surfaced at an auction in the U.S. It has the serial number 12 on the trigger and crown over N proofs. 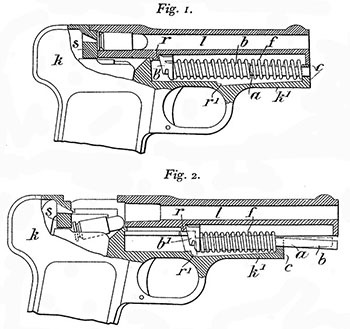 Donald M. Simmons, writing in an article about the Warner Infallible pistol, says: “It is my belief that the German Schwarzlose’s conventional bottom magazine latch was deleted from all Warners because of a fear about Browning’s U.S. patents on Colt pocket Automatics....” He further states that “...all Warner Schwarzloses had a plug attached where the bottom latch would have been.” Apparently Mr. Simmons had only ever seen a Type 1 Warner Schwarzlose. We now know that there are a number of Type 2 Warner Schwarzloses with a (slightly redesigned) magazine release on the bottom of the pistol. The possibility exists that changes made to the U.S. pistols were somehow intended to avert possible patent violations, however there is no direct evidence. 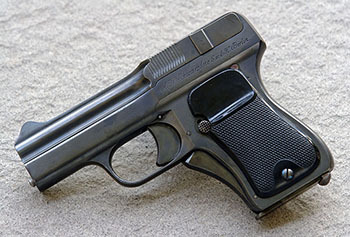 A number of people have commented that the Schwarzlose pocket pistol is uncomfortable to shoot. It has a very different feel from a normal blow-back pistol, since the barrel/slide runs forward and stops abruptly, then recoils backward. J.B. Woods comments: “...the hand receives, in rapid succession, a healthy slap from the recoil force against the solid breech, a slight secondary forward kick as the barrel reaches full travel, and another very light tap as the barrel returns to the rear.” W.H.B. Smith says: “In this type of pistol, the recoil is invariably excessive. This is to be expected in view of the fact that, whereas in the straight blowback type much of the rearward thrust of the gas inside the cartridge case is transmitted to the breechblock which carries the moving parts directly to the rear, in this type the rearward shock is transmitted through the rigid receiver in the hand;” and: “The jar caused by the barrel moving forward and again by its return as it brings up against the face of the breechblock, added to the excessive recoil, makes this an unpleasant weapon to shoot.” Gerhard Bock indicates that his trigger finger receives a blow from the trigger guard during the working of the action, and other writers have complained that the gun bruises the heel of their hand. Reliability seems to be an issue for some commentators. W.H.B. Smith states: “...even with a low-powered cartridge of the type of the .32 Colt automatic, the blowforward system was never really practical. Extraction and ejection were never very reliable and feeding jams were quite common.” We should note that the gun illustrated in Smith’s book on pistols is a fourth- variant Warner. We had occasional problems with feeding and extraction, but for the most part the gun was reliable. We know that early European 7.65mm Browning cartridges were often loaded a bit hotter than is usual today--possibly a slightly hotter load, such as the Sellier & Bellot would make the gun feed and eject more reliably. We found it difficult to insert the seventh round in the magazine due to the powerful magazine spring, and one of us was unable to get the first round to chamber due to the same issue. Remove the magazine and ascertain that there is no cartridge in the chamber. Draw the barrel/slide all the way forward and insert a pin drift, a nail, or a stiff piece of piano wire into the hole in the end of the recoil spring guide rod. Lift the guide rod upward slightly so its rear locks into the detente in the base of the frame. Remove the barrel/slide off the front of the gun. Note: Further disassembly is unnecessary for cleaning. If you remove the guide rod and spring, be aware that the front straight portion of the spring must be inserted into a small hole in the front of the frame before it can be compressed. * If you have information of any kind, copies of old advertisements, serial numbers, or photographs that would add to our knowledge of the Model 1909 Schwarzlose pistol, please write to edbuffaloe@unblinkingeye.com. Copyright 2014 by Ed Buffaloe and Ed Dittus. All rights reserved. Balderson, Robert H., Official Price Guide to Antique and Modern Firearms, Eighth Edition, House of Collectibles, New York: 1996. Blatter, Dr., “Schwarzlose Pistole - Identifizierung einer Waffe.” Deutsches Waffenjournal, January 1968. Bock, Gerhard, Moderne Faust-Feuerwaffen und ihr Gebrauch, Verlag J. Neumann, Neudamm: 1939. Bruce, Gordon, The Evolution of Military Automatic Pistols: Self-Loading Pistol Designs of Two World Wars and the Men who Invented Them. Mobray Publishing, Woonsocket, R.I.: 2012. Dickson, Jim, “The .32 Caliber Schwarzlose.” Handguns ‘94, DBI Books, Northbrook, IL: 1993. Flayderman, Norm, Flayderman’s Guide to Antique and American Firearms. Hogg, Ian V., German Handguns, Greenhill, London: 2001. Lang, Ernie, “Schwarzlose Blow-Forward Blow-Back Pistol.” AutoMag, IX. Matthews, J. Howard, Firearms Identification, Volume I. Charles C. Thomas, Springfield, IL: 1962. Schroeder, Joseph J. Jr., Arms of the World 1911: The Fabulous ALFA Catalogue of Arms and the Outdoors. Follett Publishing company, Chicago: 1972. Simmons, Donald M. Jr., “The Fallible Infallible.” Guns Illustrated, Digest Books, Northfield IL: 1975. Olson, John, and Seaton, Lionel, Famous Automatic Pistols and Revolvers, Volume 2. Jolex, Paramus, NJ: 1976. Pawlas, Karl R., “Die Schwarzlose-Pistolen.” Waffen Revue, Nr. 100, Schwäbisch Hall: 1996. Pawlas, Karl R., Pistols Digest, No. 8, Archive for Military and Arms Matters, Nuernberg. Smith, Walter H.B., Pistols and Revolvers. Military Service Pub. Co., Harrisburg, Pa.: 1946. Stewart, James B., “Schwarzlose 1909: The Unexpected Automatic.” Guns, March 1971. Wood, J.B., “Andreas Schwarzlose Created A Unique Blow Forward--Not Backward Automatic Pistol.” Shooting Times, December 1967.
and translating them for us.